For the Colorado fourteener, see Mount Columbia (Colorado). 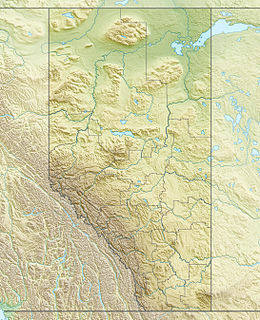 Mount Columbia is the highest point in Alberta, Canada. 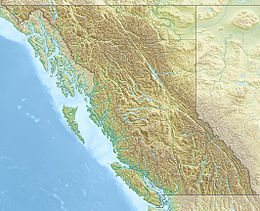 It is second only to Mount Robson for height and topographical prominence in the Canadian Rockies. It is located on the border between Alberta and British Columbia on the northern edge of the Columbia Icefield. Its highest point, however, lies within Jasper National Park in Alberta. The mountain was named in 1898 by J. Norman Collie after the Columbia River. The river itself was named after the American ship Columbia Rediviva captained by Robert Gray, who first ventured over a dangerous sandbar and explored the lower reaches of the river in 1792. Mount Columbia was first ascended in 1902 by James Outram, guided by Christian Kaufmann. The normal route is on the east face, a non-technical glacier climb that is straightforward in summer, albeit with a long approach over the icefield. Other routes include the North Ridge, an excellent route with lots of variety packed into almost 2000 m of climbing. While not technically desperate, it is still not a route to be taken lightly. (Grade V, YDS 5.7, W3). ^ a b c d "Mount Columbia". PeakFinder.com. Retrieved 2003-11-06. ^ "Mount Columbia". Bivouac.com. Retrieved 2007-01-17. ^ "Mount Columbia". BC Geographical Names. Retrieved 2014-02-09. ^ "Mount Columbia". Peakbagger.com. Retrieved 2018-03-06. ^ "Cape Disappointment State Park (WA)". National Park Service. Retrieved 2014-02-09. "Mount Columbia". BC Geographical Names. This page was last edited on 7 December 2018, at 20:18 (UTC).